It should be noted that for an attacker to be able to RDP to a system, they must already have access to the system through other means of compromise in order to create or access the necessary tunneling utility. For example, an attackers initial system compromise could have been the result of a payload dropped from a phishing email aimed at establishing a foothold into the environment, while simultaneously extracting credentials to escalate privileges. 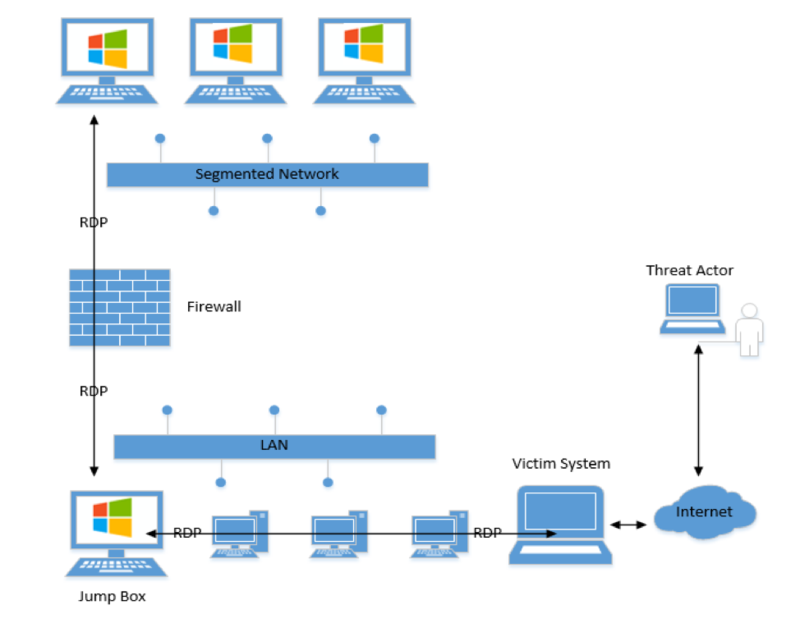 RDP tunneling into a compromised environment is one of many access methods typically used by attackers to maintain their presence in an environment. For example, a threat actor could configure the jump box to listen on an arbitrary port for traffic being sent from a previously compromised system. The traffic would then be forwarded directly through the jump box to any system on the segmented network using any designated port, including the default RDP port TCP 3389. This type of RDP port forwarding gives threat actors a way to utilize a jump boxs allowed network routes without disrupting legitimate administrators who are using the jump box during an ongoing RDP session. Figure 4 provides an example of RDP lateral movement to a segmented network via an administrative jump box. Local Accounts: Prevent the use of RDP using local accounts on workstations by enabling the Deny log on through Remote Desktop Services security setting. The TerminalServices-LocalSessionManager log contains successful interactive local or remote logon events as identified by EID 21 and successful reconnection of a previously established RDP session not terminated by a proper user logout as identified by EID 25. The Security log contains successful Type 10 remote interactive logons (RDP) as identified by EID 4624. A source IP address recorded as a localhost IP address (127.0.0.1 127.255.255.255) may be indicative of a tunneled logon routed from a listening localhost port to the localhosts RDP port TCP 3389. Domain Accounts: Employ the Deny log on through Remote Desktop Services security setting for privileged accounts (e.g. domain administrators) and service accounts, as these types of accounts are commonly used by threat actors to laterally move to sensitive systems in an environment.